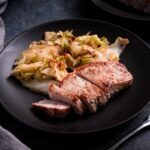 One of my all-time favorite combos for dinner is pork chops and cabbage. 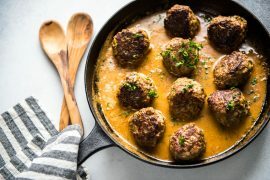 Not only is it delicious, but it’s one of those meals that feels comforting and homey but comes together in under twenty minutes. In other words, another shining example of how the keto diet doesn’t have to be complicated. 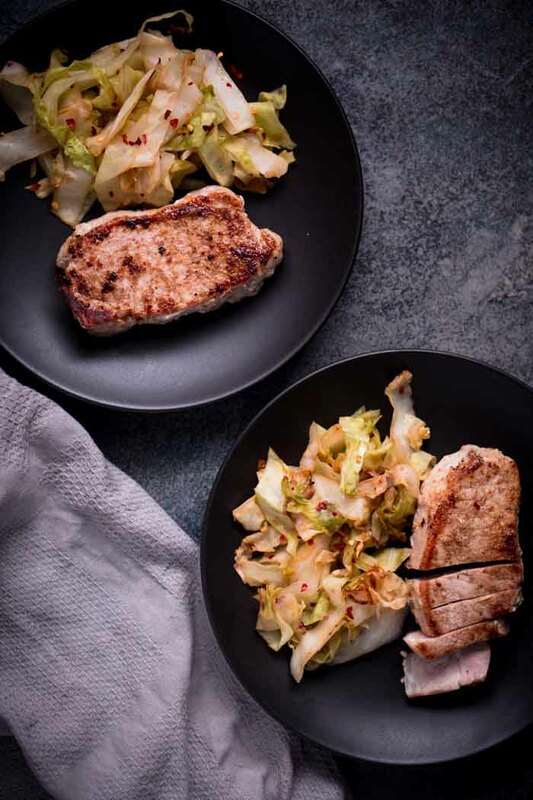 If you’ve got a frying pan and fifteen minutes to spare, you can totally rock this pork chops and cabbage recipe. Pork chops are a really excellent protein source for those who are looking to power up their protein without adding a bunch of fat. 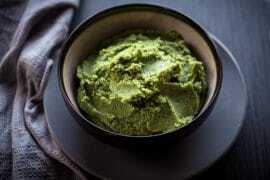 If you are doing keto for fat loss or body recomposition, then you probably have a good idea just how vital protein is. If you are struggling to hit your protein goals, give pork chops a chance. If you’re like, “Wait… what? 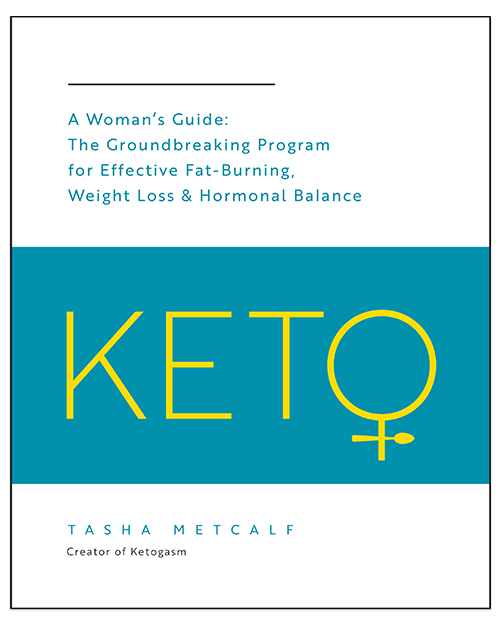 I thought fat was important on keto, not protein!” Then I would encourage you to check out this post all about keto macros for an easy to follow explanation. But if you have a case of TL;DR, I’ll summarize for you here. Protein is always essential, regardless of your other macronutrient intake. Eating enough protein is critical to spare lean body mass, fat intake is adjusted to create a calorie deficit for fat loss (fat loss > weight loss), and limiting carbohydrates is the key to shifting your body from sugar burner to fat burner, not sticks of butter. Medically therapeutic ketogenic ratios are for people who need a ketogenic diet for medically therapeutic purposes, not the average Joe or Jane doing keto. So eat a damn pork chop and stop being afraid of protein, for chrissakes. End rant, on to the recipe! 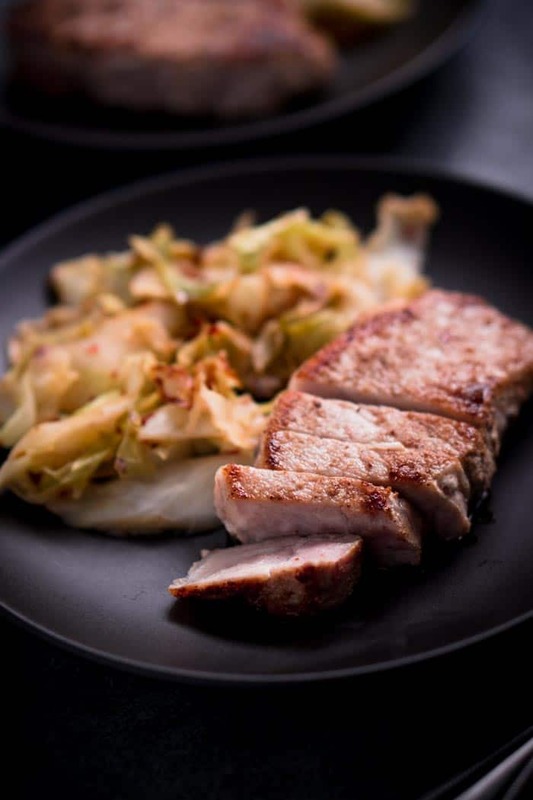 As promised, this pork chops and cabbage recipe is super simple. Just season your chops on each side with coriander, garlic powder, and salt. Melt ghee in a skillet over medium, then pop the pork chops in and cook for four to five minutes on each side. Let the pork rest for a few minutes before cutting into the meat to ensure it is as juicy as possible. Meanwhile, you’ve got a second pan going on high with cabbage, apple cider vinegar, chicken broth, chili flakes, and salt. 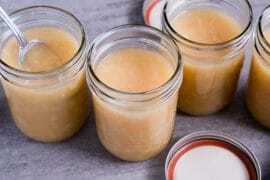 This mixture cooks down until the liquid is gone and the cabbage is soft. Keep stirring over high heat until the edges of the cabbage begin to brown. 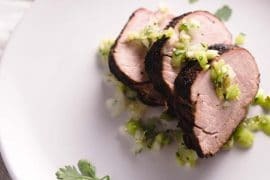 Serve it alongside your pork cut into slices. Enjoy your pork chops and cabbage dinner! 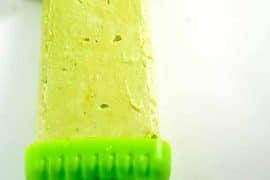 Quick and easy protein-packed keto dinner! Season each side of pork chops with coriander, garlic powder, and sea salt. 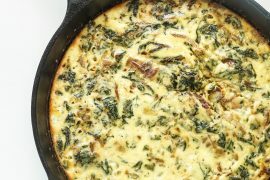 Melt ghee in a cast-iron skillet over medium heat. Cook pork chops for 4 to 5 minutes on each side, or until they reach the desired temperature (145 degrees Fahrenheit for medium rare or 160F for medium). Let rest 5 minutes prior to slicing. In a medium skillet, bring cabbage, vinegar, broth, chili flakes, and sea salt to a boil over high heat. Stir occasionally, cooking until the liquid has cooked off and the edges of the cabbage begin to brown. 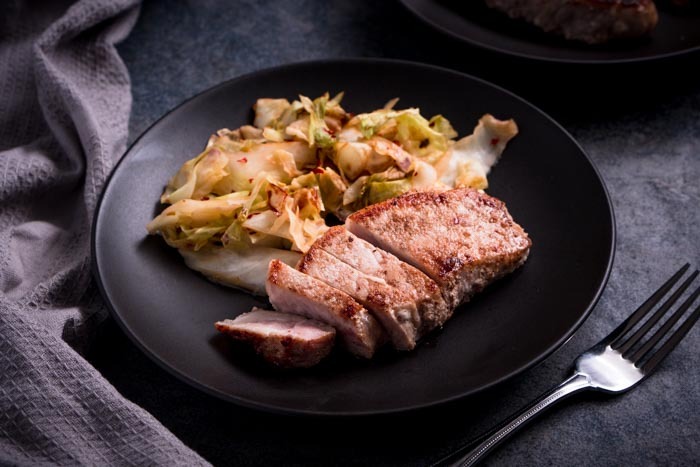 Serve pork chops sliced with cabbage on the side. This is a really good recipe, not only is the cabbage awesome, the porkchop was too. I don’t normally like porkchop. But my husband always asks me to make it, I’m always dreading it. We made this recipe two weeks in a row. Totally a keeper. Yes! Thank you for the positive feedback. You know it’s good when you make it more than once. Glad you loved it. Success! I did bone in pork chops and had to add a little extra to just about double the cabbage but it all turned out really good! I’m not the cook in our home by any means but I’m learning and my husband (the cook) said it was probably one of the. Eat pork chops he ever had! Will definitely make again!